Has the link between vaccines and autism been discredited? The text below is an Open Letter from Judy Wilyman, PhD, whose thesis examined the scientific basis for the Australian vaccination schedule. Dr. Wilyman has worked tirelessly to dispel myths about vaccination. Her website is http://vaccinationdecisions.net/. In May 2016 you stated in a newspaper article to the Australian public that the link between vaccines and autism has been “discredited” (Kylar Loussikian, The Australian, 11 May 2016). This statement is false and the former head of the US National Institutes of Health (NIH) and member of the Institute of Medicine (IOM), Dr. Bernadine Healy, stated in 2008 that “this question has not been answered”. On the 15 February 2017 Robert F Kennedy, along with other lawyers, scientists and parent/researchers, provided evidence that of the hundreds of studies that have investigated the link between vaccines and autism, 240 of them have found a link between neurodevelopmental disorders and vaccines and 81 studies found a link between vaccines and autism. They found zero (0) studies that showed that vaccines containing mercury, in the doses that are still present in children’s vaccines – Infanrix-hexa (Austin et al, 2010), whooping cough vaccines and flu vaccines – to be safe. Whilst government regulators are claiming that mercury in the form of thimerosal has been removed from all vaccines this is not the case. 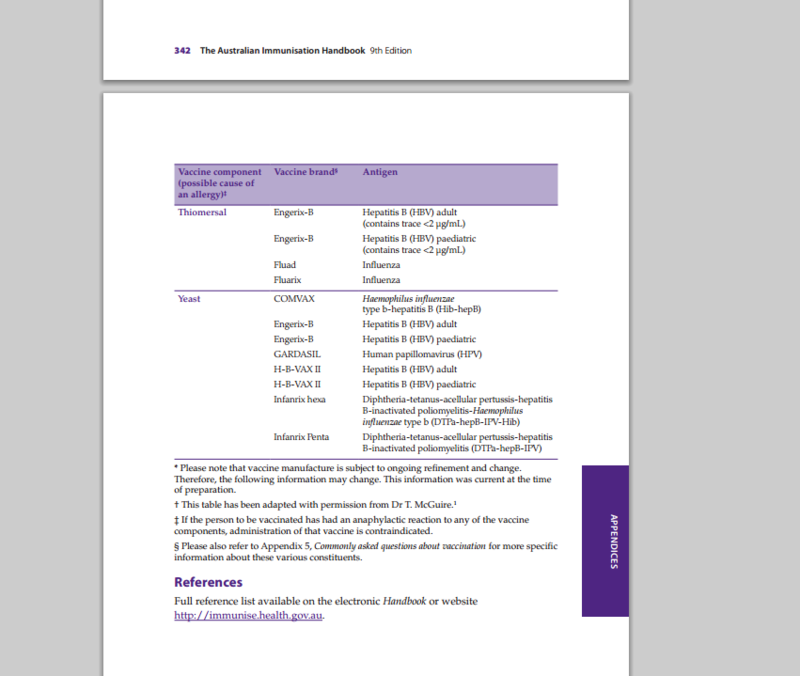 Mercury is still present in the manufacturing process for many vaccines and specifically multi-dose vials of flu vaccines and this is why it was still listed in the Australian Immunisation Handbook (ed. 9) until 2013. Whilst the CDC has used 19 selected studies to claim that vaccines do not cause autism, all of these studies were found to be scientifically flawed and many of these studies (funded and designed by CDC researchers) even described links between vaccines and neurological problems. Further, they were epidemiological studies and did not represent the diverse body of evidence – clinical, biological, animal and ecological evidence – that is needed to prove that there is no causal link between vaccines and autism, or vaccines and serious neurological and autoimmune damage in children or adults. The issue of vaccine safety is not just related to the issue of thimerosal in vaccines. To prove safety the government regulator is required to test the combined schedule of vaccines (the combination of chemical ingredients in all vaccines injected into children) against the health of unvaccinated children before it recommends this program of vaccines. This study has never been done by any government. And we have observed chronic illness skyrocket 5-fold in children since 1990 – directly correlating with the increased use of vaccines from this time onwards. The government’s claim of “coincidence” is not evidence-based medicine and this explanation is not acceptable to parents. 43% of US and Australian children now have a chronic illness many of which are debilitating and life threatening. Previously I have provided you with the evidence that refutes your statement that the link between vaccines and autism has been discredited and you and your colleagues have ignored it. I have also provided the evidence to show that the claims about vaccine safety and efficacy that you and 60 other UOW academics are promoting on the UOW website are also unsupported by evidence: an opinion piece that was put up one week after my thesis was published on the UOW website – January 2016. An opinion piece that was not written by an expert in vaccination science or policy and that does not address the evidence presented in my PhD thesis. For decades the scientific community has avoided debating the science in vaccination policies. Ignoring the academic literature, instead of addressing the arguments, is putting human health at risk. I will therefore inform you that Robert F Kennedy, an attorney specialising in environmental law, has now offered a reward of $100,000 to anyone who can find a peer-reviewed scientific study demonstrating that thimerosal is safe in the amounts contained in vaccines currently being administered to American children and pregnant women.” Thimerosal is also present in the vaccines given to Australian children and pregnant women. This is an opportunity for you and the 60 other UOW academics to provide supportive evidence for your claims about the safety and efficacy of vaccines that are on the UOW website and promoted in the Australian media. As head of the UOW Faculty of Science, Medicine and Health your comments are influencing the health of Australian children and I am asking that you provide the evidence for your claim that the link between vaccines and autism has been discredited. Please provide the study that Robert F Kennedy has requested and please address the evidence and arguments I have provided in my PhD thesis on the undone science in government policies. You have a duty to inform the public accurately on the medical literature on vaccination and Australia has an escalating number of parents who are now long-term carers for their children who will never reach their potential in life. I look forward to your prompt response to this request in the interest of children’s health and the health of the Australian community. The Science and Politics of Australian Vaccination Policies.